As it continues to flex its omnichannel strengths, Macy’s says it has finally begun marketing its click-and-collect services, and that it sees its future growth coming from Gen Y, mobile technology and exclusive products. While the company has been testing this service for some time, “this has been somewhat under the radar and we are just now marketing this convenience, so we expect we will gain traction,” says Macy’s CEO Terry Lundgren in a presentation for investors at the Goldman Sachs 21st Annual Global Retailing Conference. He says the Cincinnati-based retailer is continuing its investment into omnichannel strategies. “All of our stores can now ship directly from store to someone’s home,” for example, he says in remarks that were also webcast. “We have totally redone both Bloomies and Macy’s mobile space. My Wallet now lets them track their rewards. And we have a search and image technology that allows you to take a photo of something and find a similar item. As the company continues to concentrate more on Millennials, adds president Jeff Gennette, it is also stepping up its commitment to expand private label, exclusive or limited distribution offerings, which it says already account for some 50% of its sales. 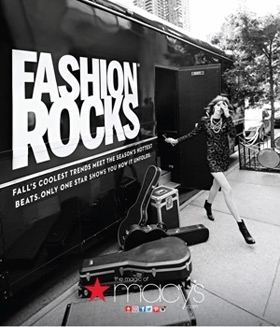 Separately, Macy’s is partnering with Fashion Rocks for both the live event Sept. 9 celebrating Fashion Week, and a television special. (Performers scheduled to appear include Jennifer Lopez, Usher, Pitbull, and Miranda Lambert.) That will allow viewers to “shop live” for certain select fashions, via macys.com/fashionrocks. And a second-screen experience is available via the Shazam app, which the company says will include special Macy's content.